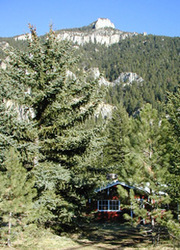 Gallatin Cabin is currently under construction, taking reservations from April 15, 2005. Gallatin Cabin sits along the beautiful Gallatin River with views of House Rock. The cabin features one bedroom with one full bath, as well as a separate sleeping bunkhouse. Accommodates two guests with two additional in the bunkhouse. More information will be available as construction progresses. Directions: Gallatin Cabin is located along the beautiful Gallatin River about 20 miles south of Bozeman with 125 feet of Gallatin River frontage.